The Pretty Posy range has been great for our springtime themed makes and today, Katie shows us how to use the delicately illustrated papers to make a layout you can treasure. 1.Paint your embroidery hoop with the Deco Art paint- Everlasting and leave to dry. When dry lightly sand the edges for a distressed feel. 2.Take a pearlescent sheet from the 12x12 First Edition Pretty Posy paper pad. Place your embroidery hoop on top of your Pretty Posy paper, and lightly draw around the hoop. 3.Carefully cut out your circle and adhere it to the back of the embroidery hoop with glue. 4.Cut a 22cmx3cm strip of coordinating Pretty Posy paper. Measure your vertical strip from the top left hand side down to 2.5cm. Cut diagonally across to the right corner. 5.From the bottom left hand side of your paper strip, measure up 2.5cm and cut diagonally to the right corner. Lightly ink the edges using the DecoArt Metallic Lustre Copper Kettle wax to give the paper a vintage feel. Leave to dry and glue it to the centre of your layout. 6.Cut a Dovecraft Floral Muse doily in half and paint the entire doily using the DecoArt Metallic Lustre Copper Kettle wax, leave to dry. Adhere this toward the bottom right of your strip. 7.Cut a 12.5cmx9cm rectangle of Pretty Posy paper and again, ink the edges with the DecoArt Metallic Lustre Copper Kettle wax. Leave to dry and layer it on to the right hand side of the Pretty Posy strip. 8.Next, cut a patterned 8cmx8cm square of Pretty Posy paper and ink the edges with the DecoArt Metallic Lustre Copper Kettle wax. Leave to dry and adhere with Dovecraft 3D foam squares to the right of your layered Pretty Posy sheets. 9.Cut your chosen photo down to 7.5cmx5.5cm. Take one, Floral Muse wooden frame and adhere the photo to the back of it. 10.Place this to the right of your Pretty Posy square, with glue. 11.Die cut to letters to spell ‘family’ using the First Edition, Modern Alphabet Die Set. Adhere each letter with glue to the bottom right, of the large Pretty Posy rectangle. 12.It’s time to embellish your layout! Take three 3D butterflies from the Floral Muse collection, adhere one to the top right corner of your wooden frame and one to the top left and bottom right corner of your second layered, Pretty Posy rectangle. 13.It’s up to you how you would like to embellish, Katie has used one Me to You Sweet Shop resin flower, a Floral Muse plastic button and gem to add to the centre of each butterfly to add interest. 14.Finish off your layout with any flourishes of embellishments you would like to add. Katie has lightly rubbed the Deco Art Metallic Lustre Copper Kettle wax on top of a few embellishments and her wooden frame to gain a rustic feel. Now you have a pretty scrapbook layout to adorn your wall! Upcycling items for home décor purposes is so much fun and with the added sentimental value of the scrapbook layout within your embroidery hoop, you’ll love being reminded of your favourite memories around the home! 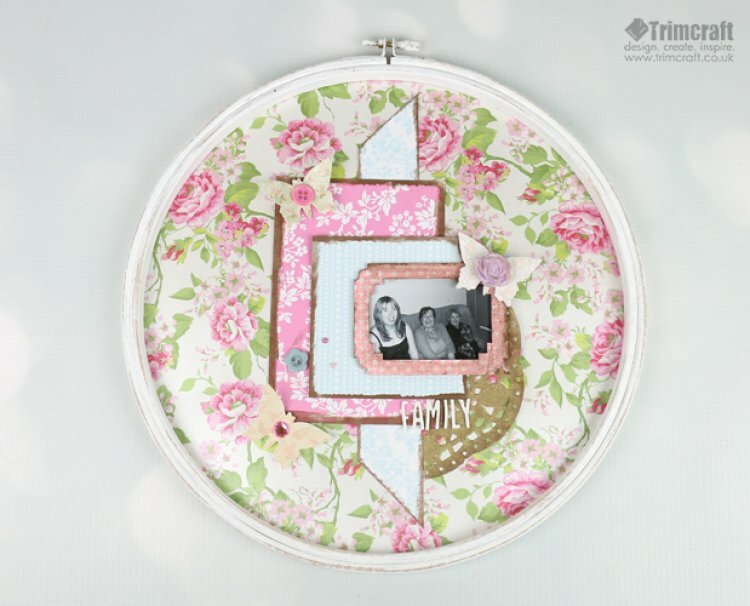 How will you decorate your embroidery hoop scrapbook layout? We’d love to see so remember to upload your wonderful makes to the project gallery and to #trimcraft on social media so we can have a nosey!